One of our biggest fears is that our clients will find out someone else who would be willing to do the same work, but for a lower price. The fear is then swiftly replaced by anger: “Aren’t those designers ashamed of themselves? They’re destroying the market!”. We end up trying to educate our clients that if they use a cheap design work or platform such as 99designs or Fiverr, they will end up with a poor design, resulting in loss and ruin for their business. What can we do? Nobody likes it when someone moves their cheese. Certainly not if it hurts their livelihood. The main factors that drive prices down (of everything, not just design) are globalization and technological progress. But, even though I hate to earn less, I feel a little hypocrite hating the very same things which help me as a consumer spend less money when buying stuff. A few months ago, my wife and I moved into a new apartment. Since we moved I’ve been to IKEA four times already. Last Thursday I thought about going to a movie with my wife. Guess what? We ended up going to IKEA. I bet she enjoyed it much more. I actually do understand that. But my budget for a table is $150, not $850. Sorry. 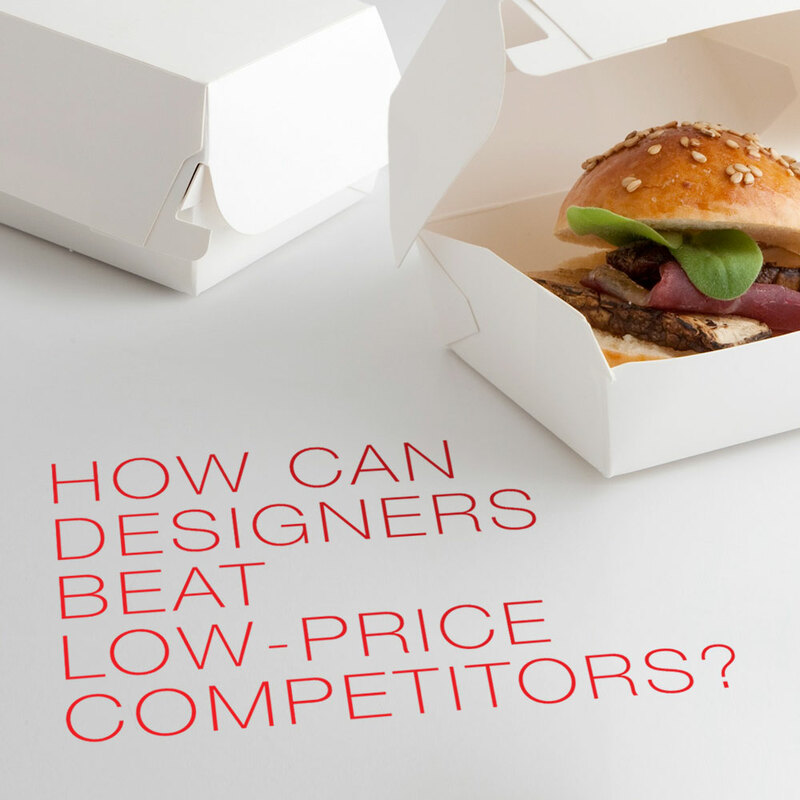 How can we deal with low-price competitors? Discussions in the design community focus a lot on the need to “educate the market”. Explain and teach the clients the value of good design – “Like they value design in Europe! “. I’m all up for this idea. But you have to understand something: educating the market is something that takes a long time and is very expensive. Why? Because you need to explain again, and again, and again to lots of people over time (you can call it “brainwashing”). Ask any huge corporation seeking to launch a new product, what happens if it needs to educate the market to eat healthy or stop using plastic bags at the supermarket. It’s difficult, expensive and takes time. Michael the artistic carpenter can try to convince me to take advantage of his high quality carpeting for my dinner table; and there might be a point in his arguments, but to prevent me from going to IKEA would be very difficult. I’m totally up for educating the market, but let’s be realistic – it’s not something that is going to change overnight. So, what can we do in the meanwhile? Meanwhile, even though McDonald’s sells coffee at 99 cents to the masses, the queues at premium café’s – despite being much more expensive – aren’t getting any shorter. Take for example the Grey Dog café in New York. A trendy coffee shop, where a Cappuccino costs 4$; and there are plenty of people willing to invest in the experience of quality coffee and food, without needing to be educated to understand why they should pay so much for coffee. If you want to be the Grey Dog of design and deliver high-quality expensive designs to your customers – I fully support that. You don’t have to hate your cheaper competitors because they aren’t really your competitors, even if you sell the same service. It’s hard to imagine a customer in a café in New York arguing with the waiter, telling him how the McDonalds two blocks away can sell him a cappuccino at 99 cents, right? Why? Because the place is designed in a way which makes it obvious to anyone what they’re going to buy and how much it’s going to cost them. If you want to be the Grey Dog of design, communicate it to your customers: the way you look, the way your portfolio looks, your office and your proposals – then there won’t be any confusion. Whoever comes to you knows what they are getting and how much it’s going to cost. But please note – if you would go to a dirty fast food joint that asks $9.90 for a hamburger, you might raise an eyebrow and ask how come the McDonalds next door sells a burger for a dollar. If your customers are confused, maybe you aren’t properly communicating who you are, what you sell and how much it costs. Or you compromise. At Grey Dog they don’t compromise on the quality or the price of the coffee. Despite globalization and technology, there are things that are still very hard to do, which computers can’t do and are not easy to outsource. As a result, they are worth a lot of money. These three areas, which are usually a part of the good designers’ skill set, are actually skills that are worth a lot of money to our customers, and serve as the foundation for good design. Many designers use these skills as part of their job, and that’s what makes good design expensive (because it is a long and difficult process). Our customers realize you can buy a logo for $10. But as time goes by, they understand that their companies won’t survive in the competitive jungle out there if their design is based on cheap aesthetics instead of a good idea that can take their business forward. We can and should give them this idea.